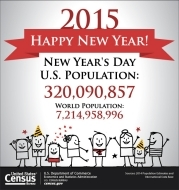 As our nation prepares to ring in the new year, the U.S. Census Bureau today projected the United States population will be 320,090,857 on Jan. 1, 2015. This represents an increase of 2,334,187, or 0.73 percent, from New Year’s Day 2014, and 11,345,319, or 3.67 percent, since Census Day (April 1) 2010. The projected world population on Jan. 1, is 7,214,958,996, an increase of 77,381,246, or 1.08 percent, from New Year’s Day 2014. During January 2015, 4.3 births and 1.8 deaths are expected worldwide every second.